VITE is listed on Bittrex! Check Bittrex official announcement. 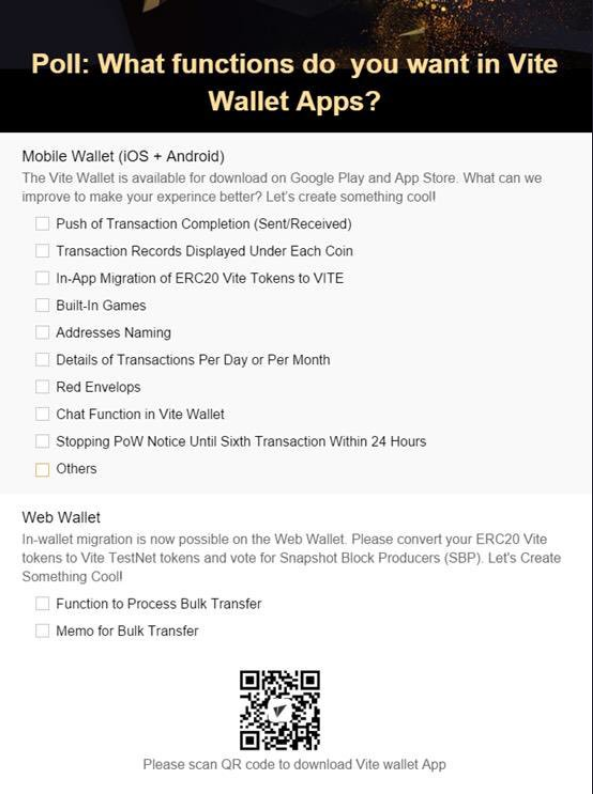 The voting feature on the Vite Android wallet has been developed. iOS V1.3.0 added in a Discovery module to support Vite’s latest activities. It is expected to be launched in mid-January. The in-wallet airdrop feature is in joint debugging phase. The QR code of Vite Pay specification and development is finished. The ‘Announcement’ feature has been released within the Block Explorer. The Vite community will be more informed about any system updates and iterations information. Optimization of ws disconnection / reconnection mechanism. The go-vite smart contract is currently being tested. There was a focus on optimizing the p2p logic, speeding up node discovery, fixing suspended animation during synchronization, and enhancing connectivity between SBPs. Account verification logic optimized to increase verification speed. The contract chain has been optimized and the block logic released to improve the response efficiency of the response block. The full-node API supports sub-token query transaction lists. Vite has added a quota calculation function that monitors the last hour of data usage and distribution patterns seen in the entire network. The team has prepared for a feature that will facilitate an automatic adjustment of the quota limit, dependent on how busy the whole network is. Go-vite version 1.2.0 has been released from the snapshot block height of 578,8912, which is a hard fork name-coded as Smart. After hard fork, go-vite will support creating contracts and calling contracts. The back-end system design has been finished, contributing to an overall 40% of back-end development that is completed. The exchange’s built-in contract completed V0.1, code refactoring. V0.2’s development is 10% completed. V0.2 added rules regarding transaction fees, quota verification, timeout order processing, and optimized storage. Built-in contract V1.0 was improved upon. The new Vite Store has already started testing its functionality. This new store will encourage and support global commerce and international web traffic. 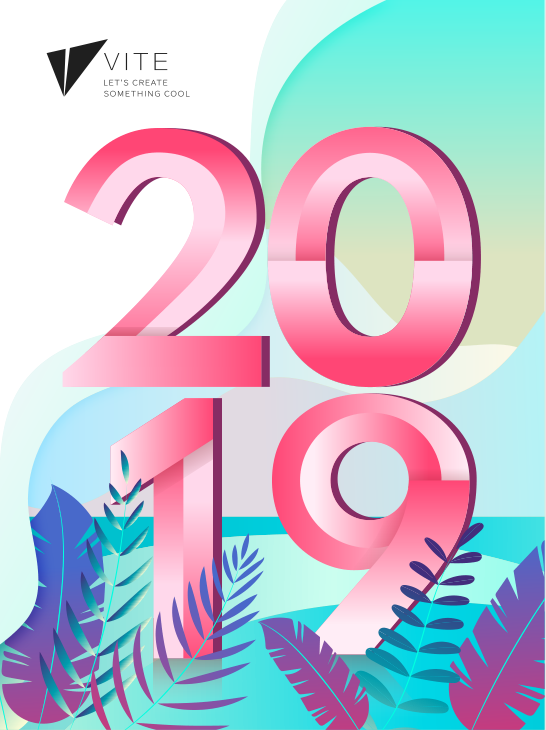 In efforts to prepare for and celebrate the Chinese Spring Festival, Vite Store will be releasing the Vite New Year’s desk calendar. On January 7th, the Android Wallet debug activity was released. Different kinds of informative feedback on the bug were rewarded with different amounts of VITE (200–500 VITE). On January 9th, a survey based on the functioning of Vite wallet was released to the community. From January 7th to the 21st, the Vite Forum Writeup Campaign is live. Users can post their insightful, opinionated perspectives about the Vite TestNet experience and get rewarded VITE. The length of the posts and the informative nature of the content dictates who can be deemed a forum campaign winner. From January 10th to 31st, all users who participate in our January Token Conversion campaign and transfer ERC20 VITE to TestNet will get 1% of the conversion amount as a reward. From January 3rd to February 3rd, the #ViteVS campaign has been buzzing with activity. The primary purpose for this campaign is to give our community a voice and let them compare Vite to other public chain projects. Provided all campaign guidelines are met, each insightful #ViteVs tweet can win 300 Vite in rewards this month. On January 5th, the winners of the Bitcointalk Signature Design Competition were announced. Umсkа and Fanomoello won first and second place respectively. We are currently holding a Bitcointalk Signature Campaign. Join us HERE! 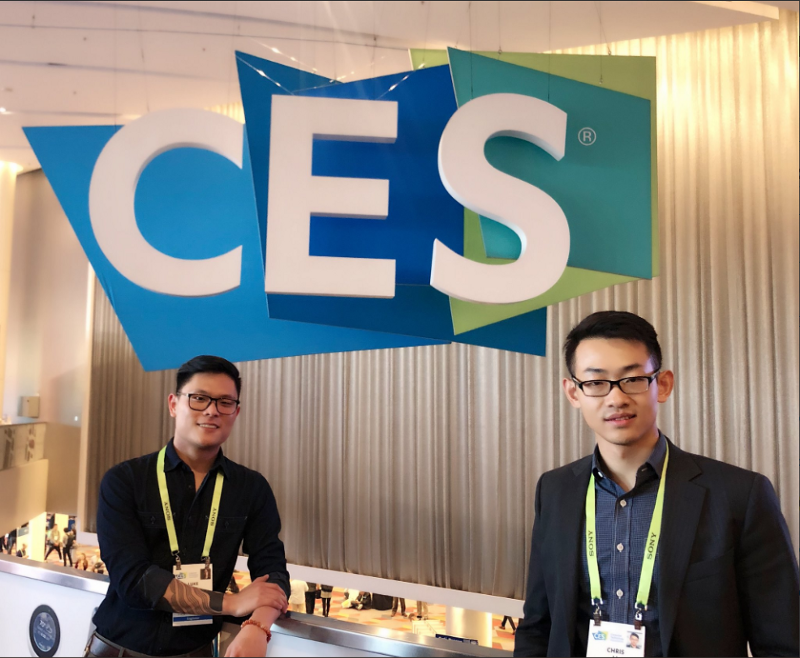 On January 9 to 11th , the Vite team attended CES Conference in Las Vegas, and had an opportunity to network with blockchain companies around the world. We want to thank the Dutch Consulate for introducing us to blockchain projects in the Netherlands. On January 15th, Vite CMO Luke mentored at Berkeley Method of Entrepreneurship, focusing on collaboration with students interested in the blockchain industry. Vite Labs is currently exploring a blockchain partnership with the City of Syracuse, New York on the use case of implementing micro-loans to low-income residents.